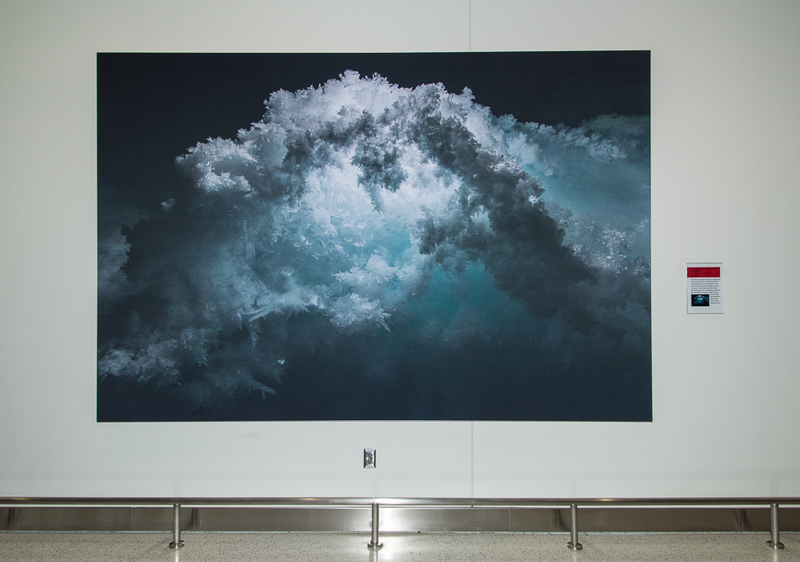 Two photographs taken inside the Erebus Ice Tongue cave in Antarctica were selected by a panel of arts professionals as part of a series of temporary exhibitions by Maryland artists in the D/E Concourse at Baltimore-Washington International Marshall Airport. Enlarged to 7 x 10 feet, they have been on view in two of these displays for several months each. The current display runs through midsummer 2018. The theme of both murals is the seven-star constellation most Americans call the Big Dipper, as it is known in different cultures and different eras around the world. Touch the Stars was designed in low relief and high contrast colors to be accessible to the 10 per cent of the school's students who are in a program for the visually impaired. Two Bears and Variations was painted on the side of a three-story rowhouse. The three panels each portrays a different legend or name associated with the stars scientists call Ursa Major and Ursa Minor (the Great Bear and the Little Bear). See images and project description below. "Fractal Arch, Erebus Ice Tongue Cave, Antarctica"
"Cloudburst, Erebus Ice Tongue Cave, Antarctica"
In many Northwest European cultures the constellation was known as The Wagon, sometimes seen as being pulled by three horses. On clear nights a faint star can be seen near the middle "horse," which was identified as "Jack on the middle horse." In Germany, he was called "Hans Dumkin" (Dumkin translates as Thumbkin), and legend had it that he was rewarded with a place in the heavens for his kindness to a stranger who turned out to be Jesus Christ in disguise. Ursa Major, the Great Bear, comes from Greek mythology and is the name scientists still use for these seven stars and other nearby stars. Callisto, one of Artemis' band of nymphs, was impregnated by the god Zeus while she slept. Since Artemis' nymphs were sworn to virginity, she was expelled from the group and according to some versions, Zeus' jealous wife Hera turned her into a bear. When her son Arcas had grown, she encountered him in the forest, but he failed to recognize her and raised his bow to shoot. Zeus intervened and turned Arcas into a bear, too, grabbed them both by their long tails and hurled them into the sky where they remain as Ursa Major and Ursa Minor (the Great Bear and the Little Bear). Ursa Minor contains the North Star, Polaris. The Chinese mapped and named constellations, but at certain points of their history, rather than forming pictures by connecting the dots and noting their resemblance to certain forms, they labeled the individual stars in a particular region of the sky as specific figures or objects belonging to a group. In the third millenium B.C. and afterward, this group represented Wen-chang, the God of Literature, seated on an emperor's throne before his court. Before him stand K'uei, Minister of Literary Affairs of the World; Chu-i, Mr. Red Coat, Minister Who Looks After the Welfare of Students; Chin-chia, Mr. Gold Armor, a minister who recruits talented students to serve the government and Kuan-ti, God of War, whose job it was to prevent wars. Rounding out the retinue are a court jester and Wen-Chang's pets. Legend has it that K'uei was a gifted student with a deformed face who won a prize for his literary examinations, but when the emperor was to present his award, he registered shock at K'uei's appearance. Humiliated, K'uei leaped from a cliff into the sea, but was rescued by a kindly sea monster and conveyed to his place in his heavens, where he was given his ministerial role. Several East Coast Native American tribes told a story that included this constellation and a number of neighboring stars. The bear emerges from her den each spring and is hunted by seven birds, three of which are depicted here: the robin, who carries an arrow, the chickadee, who carries a frying pan to cook their prey and the Canadian jay. The birds chase the bear through the summer, finally catching up with it in the fall when the robin stabs the bear with the arrow. The bear's blood stains the robin's breast red and also causes the autumn leaves to change color. The bear dies, to be reborn in the spring when the cycle begins again. It is interesting that widely separated cultures such as the ancient Greeks and the Native Americans all saw a bear. Scholars explain this by noting that the orientation of the constellation changes noticeably with the seasons, along with the hibernation cycle of the bear—in the winter it is upside down as if lying on its back. The hibernation cycle of the bear makes it a potent symbol of death and rebirth. The constellation was known to the Ostyak people of Siberia as the Moose. Other cultures also saw four-legged animals such as reindeer. Seven Macaw is a character in the Mayan epic The Popul Vuh. In the darkness before the world's dawn, Seven Macaw was helpful to humanity, guiding them with his light. However, arrogance leads him to brag that he is more important than the sun and the moon. One day the twin heroes of the The Popul Vuh teach him a lesson. They hide beneath the fruit tree where he feeds and hit him with a blowgun dart, knocking him over the tree top and down the other side. In the latitude of Guatemala where the Mayans lived, this describes the trajectory of the constellation through the sky—once a day making an arc up through the sky and descending to the horizon. Anthropologist Dennis Tedlock also thinks that Seven Macaw must be shot because he offends the Hurricane god. In July, the constellation is out of sight in those latitudes, and mythologically speaking, this clears the way for Hurricane to bring the summer rains. The Ancient Egyptians referred to this constellation as a bull's hind leg. It was associated with the goddess Seshat. One of her roles was laying out foundation plans for temples and wall reliefs show her with the pharaoh establishing the orientation of temple plans in relation with texts explaining that this was determined in relation to the Bull's Thigh constellation. Since this constellation never sets, it also symbolized immortality, and in paintings priests are shown performing a ceremony where the mouth of the king's mummy was touched with a bull's thigh or an adze made to remsemble the constellation's shape. The Bull's Thigh was also linked with the leg of the god Set. Ursa Major (The Great Bear), detail of "Two Bears and Variations"
The Little Dipper, detail of "Two Bears and Variations"
The Big Dipper, detail of "Two Bears and Variations"
Leo the Lion, detail of "Two Bears and Variations"
Baltimore, Maryland, home of the Space Telescope Science Institute (the Hubble Space Telescope's headquarters), also hosts a marvelous outdoor mural depicting Ursa Major and Ursa Minor. Painted in 1993 by local artist Helen Glazer, it adorns the east wall of 1224 West Lombard Street near downtown. Amazingly, the mural is nearly anatomically correct, as it is sprinkled with little curlicues representing six of the nine Messier galaxies in Ursa Major. Glazer says she downloaded a star map, whited out the "little stars," and accurately recreated the map on the cinderblock wall. Each June the Baltimore Bicycling Club sponsors a Sunday-morning ride when we visit downtown murals. "The Bears" are among the group's favorite stops. Traditionally, I (in the striped shirt, pointing at the mural) give a short talk on interesting aspects of the two star groups. Next time you visit Baltimore, be sure to make a side trip to its unique celestial scene. You will not be disappointed. Touch the Stars (1997): The theme of this mural is the seven-star constellation most Americans call the Big Dipper, as it is known in different cultures and different eras around the world. The mural was designed to be accessible to the 10 per cent of the school's students who are in a program for the visually impaired. 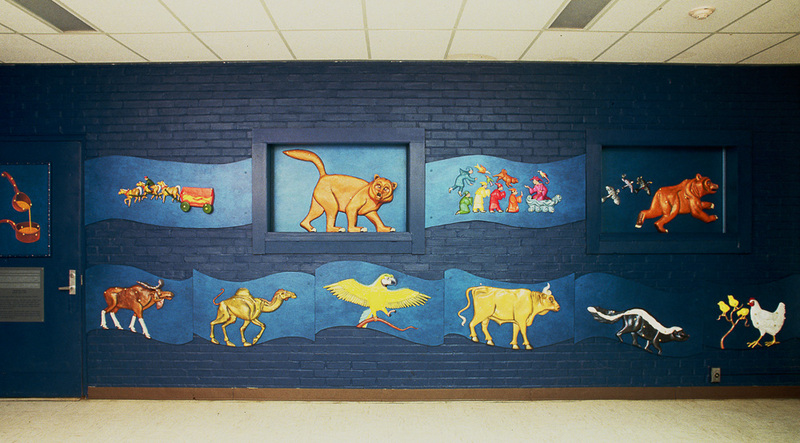 Two Bears and Variations (1993): This mural also has a constellation theme: each of the three panels portrays a different legend or name associated with the stars scientists call Ursa Major and Ursa Minor (the Great Bear and the Little Bear). In the center is the Big Dipper and Little Dipper and on the right is Three Leaps of the Gazelle, an Arab legend in which the three pairs of stars in the Bear's paws represent the leaps of the gazelle as it escapes from the constellation Leo. Two Bears and Variations has been featured in an article on the Baltimore mural program in Baltimore Magazine (2001) and was pictured in the Letters section of the January 2003 issue of the astronomy magazine Sky and Telescope. The photo was submitted by Herman M. Heyn, Baltimore's "Street Corner Astronomer," who participates in an annual mural tour of the Baltimore Bicycling Club. In the photo, he is shown pointing out astronomical features to the cyclists. View the photo and letter in the slide show above. It has also been a stop on the Baltimore Mural Bike Tour sponsored by Monumental Bike Tours and the Baltimore Office of Promotion & the Arts.